Solve ultimately the problem of power system, including noise, lightning, and leakage current etc. Ensure the safety and stability of the UPS power output. With friendly design, different from the strict operation procedure of other brands’, UPS will not be damaged by any incorrect operation. Increase the reliability and efficiency. Make the system extremely high reliable. Permit quick and convenient maintenance. Characteristics will not be violated under 100% unbalance load. Prolong the battery life expectancy. And with huge charging power (selectable), can charge very big capacity, long back-up time battery bank. Test the battery without the risk of output AC failure in case of battery bad. And with battery fluid leakage and improper grounding detect circuitry, can ensure safety of the battery bank. Increase the fan life expectancy and reduce audible noise. Control circuitry and power circuitry are physically separated. 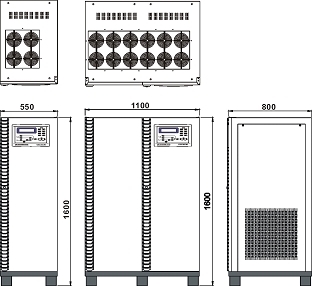 Therefore, the UPS system can operate under harsh environment. Can be started without AC mains (with battery only) and no any large surge current being drawn. Remote control panel, 3 phases software for PC monitoring, auto dialing module, battery monitoring module, 3 phases SNMP card, and emergent stop switch are available. Reduce harmonic current for 80KVA and above UPS. Reduce T.H.D. (Total Harmonic Distortion) of input current. Connect up to 8 units to increase the capacity. 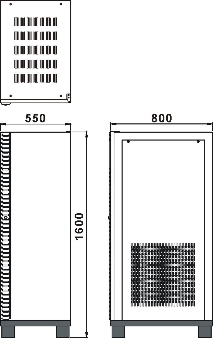 The battery cabinet is designed with the same size and outlook as the UPS for convenience of installation when several cabinets of UPS and battery are aligned together. It can accommodate Lead Acid maintenance free battery 26Ah/12V*29pcs(1set) or 58pcs(2sets). 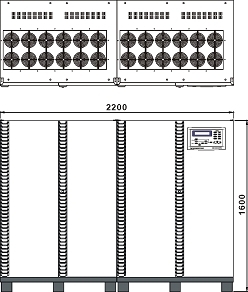 26Ah/12V ×29pcs ×1set is about 360kgs. 26Ah/12V ×29pcs ×2sets is about 620kgs. A hand held display module with LCD and LED can monitor 1 – 99 UPSs with RS-485 connected in series from distance < 1000M. In case of abnormal situation, it will automatically dial to specified service center for help. Multiple phone numbers can be set and no dedicated line is required. 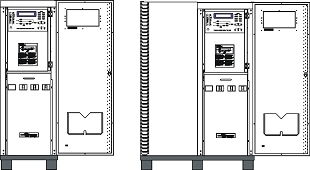 Can provide real-time three phases information of UPS connected on the line and monitor several UPSs with one PC. An intelligent module to keep watching each battery in a battery bank connected in series and can distinguish and repair the aged battery before it is seriously worn out. Can monitor and manage the UPS through Web browser and Java applet, providing simultaneously three phases data acquisition. Be installed outside or nearby the UPS for stopping the UPS output in case of emergency. Yes, UPS can be started without AC source. ☆ Different specifications required are available. ☆ All specifications mentioned above are subject to change without prior notice.